Wake Forest’s men’s basketball team has found a star in the making in sophomore forward John Collins. Following a 75-67 win at Richmond on Dec. 3 and a 91-74 route over Charlotte on Dec. 6, Collins is second in the nation in offensive rating and has four straight double-doubles for the 7-2 Deacons. Posting a line of 22 points and 15 rebounds in just 21 minutes against Charlotte, Collins has been hyper efficient for Wake Forest. When asked how many minutes Collins would optimally play if he keeps up this efficiency, Wake Forest head coach Danny Manning responded “40,” or the entire game. “This was a really good game for him in 21 minutes,” Manning said. 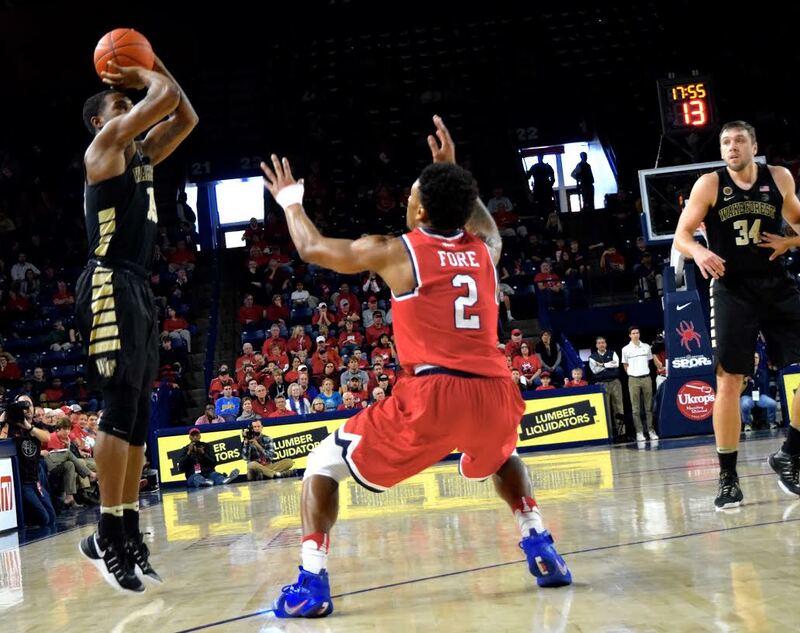 Wake Forest’s win over the Richmond Spiders on Dec. 3 vaulted them to 6-2, and proved that the Deacons are at their best when the scoring load is shared. Collins, graduate transfer Austin Arians, junior Konstantinos Mitoglou and redshirt sophomore Keyshawn Woods all reached double figures in scoring, keeping the game just out of reach for the Spiders, who never led throughout the contest. Returning home to face off against the Charlotte 49ers, Wake Forest used their rebounding skills to maintain a consistent advantage over the 49ers. The Deacs finished with a 37-28 rebounding advantage. Against Charlotte, it wasn’t just Collins filling up the stat sheet, though. Three other Deacs notched double digits in points, with sophomore Bryant Crawford, Woods and Mitoglou dropping 15, 12 and 11. Woods was playing against his former team, and there was a small altercation in the second half involving multiple players from each team. Perhaps the most promising sign for Wake Forest, though, was their proficiency from the free throw line. After shooting 66 percent from the line last season, shooting 27 for 34 from the free throw line at 79 percent is a huge step that Wake Forest will need to continue to consistently take in order to simply stay in the game with the likes of Duke and NC State.